This is a large glass jar and well worth it. 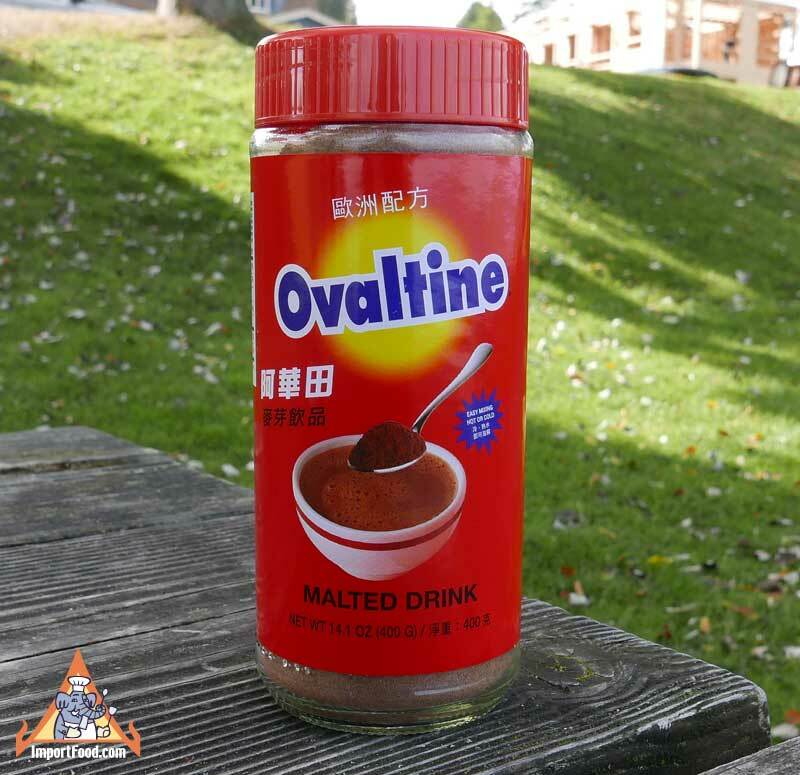 Thai Ovaltine is true to the original British formula, unaltered like the American Ovaltine which has been changed over the years to add more sugar. Thai Ovaltine has much richer barley malt flavor. It's also loaded with vitamins, and tastes just like you remember. Some exective chefs use Thai Ovaltine in their dessert recipes, notably pastry chef Sherry Yard of Spago in Beverly Hills. Mix with milk and enjoy hot or cold. We prepared the recipe below from Sherry Yard's book "Desserts by the Yard: From Brooklyn to Beverly Hills", and it was very good. Ingredients: malt extract, milk, cocoa powder processed with alkali, whey, tapioca syrup, modified palm oil, vitamin mix (pyrodoxine hydrochloried, calcium pantothenate, thiamine mononitrate, ascorbic acid, vitamin b12, vitamin A acetate, riboflavin, niacinamide, alpha-tocopherol, vitamin D3, ferric orthophosphate, lactose, manganese sulfate, potassium iodine), dicalcium phosphate, magnesium carbonate, salt, vitamin A acetate, vanillin, folic acid, ferric pyrophosphate, zinc sulfate, water. We recently discovered that some executive chefs use Thai Ovaltine in their dessert recipes, notably pastry chef Sherry Yard of Spago in Beverly Hills. Thai Ovaltine is true to the original British formula, unaltered like the American Ovaltine which has been changed over the years to add more sugar. Thai Ovaltine has much richer barley malt flavor. It's also loaded with vitamins, and tastes just like you remember. Packed in a nice tall glass jar, a large quantity that will last. Mix with milk and enjoy hot or cold. We prepared the recipe below from Sherry Yard's book "Desserts by the Yard: From Brooklyn to Beverly Hills", and it was unbelievably good.